When to use Visine® Products? VISINE® offers a range of products that help keep your eyes comfortable, ensuring they look and feel their best. We all occasionally get red eyes or irritated eyes. This may look like a red spot on your eye or red veins visible in your eye. 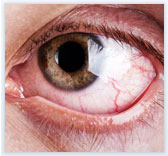 This irritation can be caused by many things, such as dust, smoke, pollution, lack of sleep, use of alcohol, or eyestrain from working on a computer screen or driving. VISINE® offers products that can help to alleviate your symptoms, such as red eyes, and get your eyes back to looking and feeling their best. These products includeVISINE® Clear and VISINE® Advanced . If the redness and irritation worsen or persist for longer than 72 hours, if pain develops, or if you experience changes in your vision, contact your doctor for an appointment as soon as possible. Does eating carrots improve my eyesight? Will reading in dim light harm my vision? Is staring at the computer all day bad for the eyes? How often should I have eye exams? Is having a twitchy eyelid normal? How can I protect my eyes in the sun? What is the difference between VISINE® SEASONAL RELIEF®, VISINE® Original and VISINE® Advance with Antihistamine eye drops?